Stunning sights, classic songs, and young love anchor this rhythmic ride. Given the constant juggling act that is my schedule—as a freelance writer and work-at-home dad to a four-year-old—I tend to gravitate towards iOS games that I can play for moments at a time. Quick in, quick out: it’s tough to find focus for much more. But with Lost in Harmony, I got comfortable in bed one night, plugged in headphones, and played through the entire hour-or-so main adventure in one run. 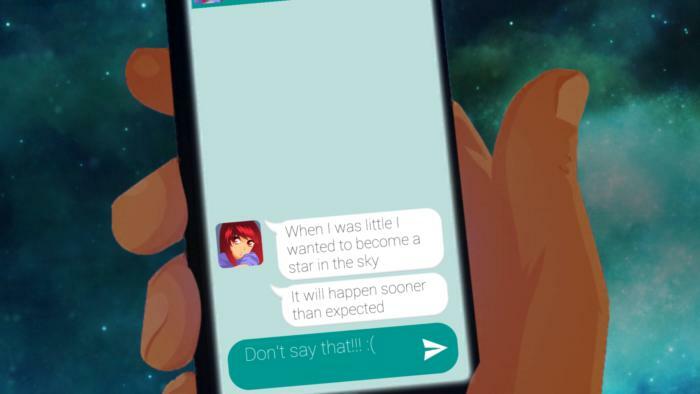 I could have enjoyed a couple of levels and saved the rest for another time, but honestly, I didn’t want to put it down: Lost in Harmony is a uniquely gripping rhythmic odyssey that has a serious narrative underpinning the tap-and-evade gameplay. Watch out for the bikes! Threats come from behind and occasionally ahead, and you’ll need to switch lanes or leap to avoid them. 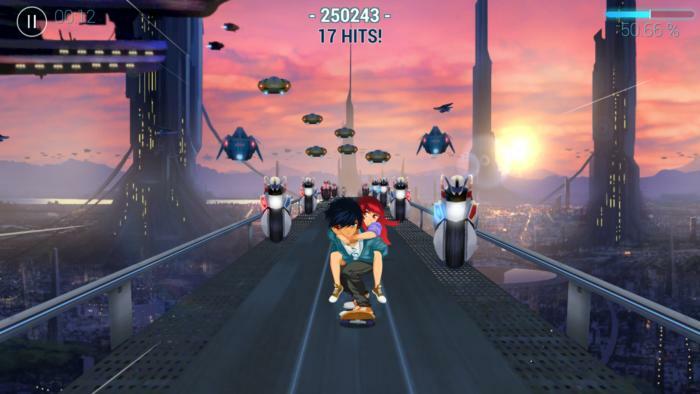 It’s an odd concoction of elements, pairing a runner with a beat-matched music game, not to mention a story and delightful graphics, but it all comes together well and resonates rather strongly. At the very least, you can easily claim that you’ve never played anything quite like this on any device. Eager to give it a shot? Here are three ways in which Lost in Harmony enthralls. 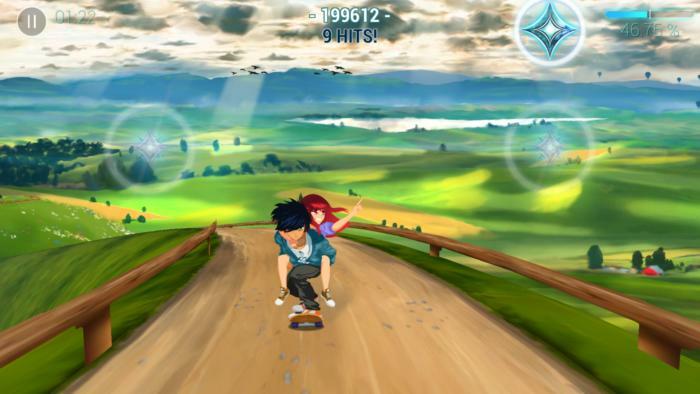 Mashed-up melody: Much of the time, Lost in Harmony takes the form of an auto-runner, except you’re skateboarding towards the screen instead of bolting away from it—think of it like Temple Run in reverse (and on four wheels). Here, the goal is to dodge hazards, whether they’re boxes and barriers up ahead, cyclists or cars from behind, or even giant eagles or trucks zooming in from the sides. How do you jump over or skate around something you can’t see? The game helpfully provides a little warning icon, but more importantly, any jumps are timed to the beat of the song. At times, you’ll tap the little beat-matched icons that appear instead of worrying about the path. Also timed to the beat of the song are little icons that appear during certain parts of stages, which you’ll tap to clear. 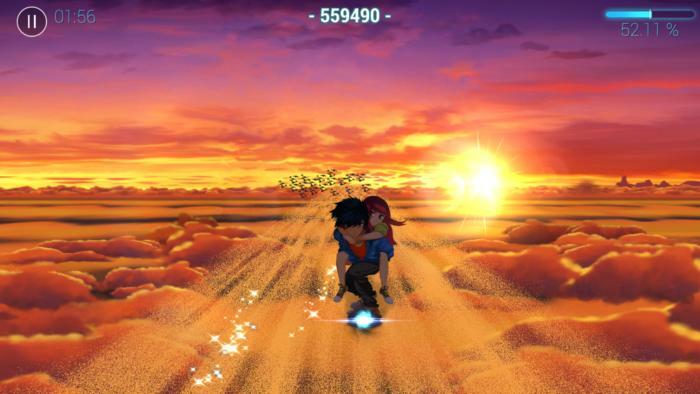 Lost in Harmony alternates between these two gameplay elements and occasionally requires you to handle both at the same time, which is a little difficult to manage. But the rhythmic approach helps you stay on top of things when the game gets really intense later on. 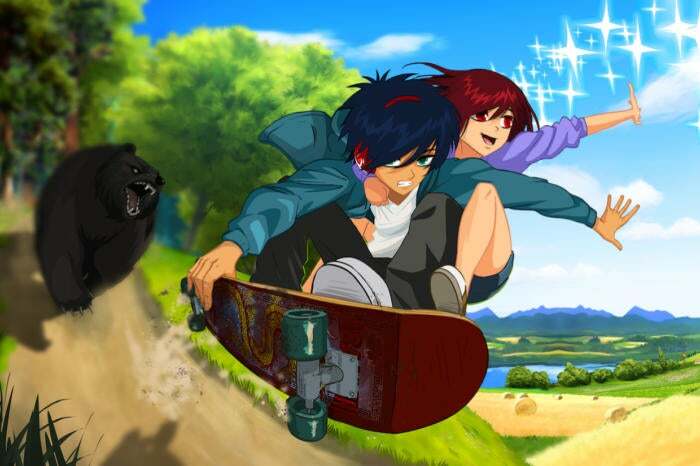 It’s surprisingly affecting: Notice how the skateboarding boy (Kaito) has a companion clung to his back? That’s Aya, and she’s very sick—the story unfolds via text message exchanges between levels, as we learn that she’s undergoing treatment… but things aren’t improving. It’s sad and eventually startling, but that adds a richness to the game that’s left open to interpretation. Given the over-the-top fantasy elements in some of the stages, especially later on, I took it to mean that Kaito is helping Aya escape from her very harsh reality by taking her on these dreamy escapades. The teen dialogue might generate eye rolls, but these short exchanges add real gravity to the adventure. And then there’s a bonus adventure that’s very much not emotional or serious, in which you guide a wheeled, headphone-wearing robot (M.I.R.A.I.) through some of the same kind of terrain. These stages tend to be tougher, so just think of it as a bonus challenge—and a lighter aside after the affecting main journey. It’s stunning throughout: Lost in Harmony is a rhythmic game, so obviously the music is key—and it doesn’t disappoint here. Most of the tracks are mash-ups of familiar classical themes, with compositions from Handel, Tchaikovsky, Brahms, and Beethoven in the mix, and even if you don’t know the composers, chances are you’ll recognize a lot of songs. But they’re creatively twisted up and intensified, with electronic and dubstep influences popping up here and there. Even Wyclef Jean contributes an original song! It’s a weird blend all around, but everything is well-executed. The game is a pleasure to look at, too, with transforming backdrops that match the sudden shifts in the music. It’s a sight to behold when the environment suddenly folds up and becomes something else entirely, or later when the pair skateboards atop a trail of dust floating above the clouds at sunset. It has really surreal and strange segments, but also really beautiful, calm moments as well. And you can even create your own levels with imported local or SoundCloud songs. Lost in Harmony has some really beautiful moments. It’s worth noting that Lost in Harmony began as a premium, $4 release last year, which is when I first encountered it, but now it’s solely available as a free-to-play experience with some accompanying frustrations. For example, to play through one of the entire stories in a single sitting, you’d need to get extra hearts by watching a video ad or paying the in-game stardust currency, which you can buy with the orb currency… which you can gradually earn or just buy with real cash. Or you can just pay $4 for unlimited hearts and skip all of that nonsense. Anyone who bought the premium version can get an unlock code for unlimited hearts by emailing in the App Store receipt (instructions are within the game’s menus now), so at least you’re not punished for being an early supporter. Still, the tangled freemium systems are an annoyance that slightly detract from the original experience. Thankfully, it’s not enough to sour my recommendation. Lost in Harmony is such an imaginative delight throughout, whether it’s sad or sweet, serene or punishing. You don’t have to play each adventure all at once, like I did—but if you enjoy music-based games or emotionally-charged interactive experiences in general, it’s a journey well worth taking.